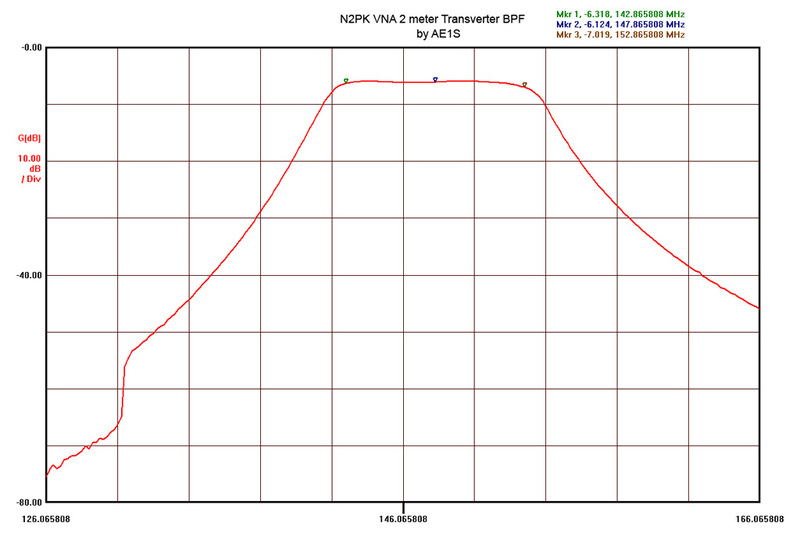 The N2PK VNA frequency range can be extended by using transverters. While the N2PK VNA covers the entire 0.05 to 60 MHz, additional frequencies are covered only on specific bands. Paul, N2PK and Ivan, VE3IVM developed two transverters in order to cover the 2m and 70 cm amateur bands. Both transverters share exactly the same design and PCB with only a few differences in the BOM - the frequency of the Local Oscillator (180 MHz for the 2m version and 400 MHz for 70cm) and the the components of the Band Pass Filter (different set of components for each filter, changing their frequency range). I started with the 2m transverter kit from Ivan, VE3IVM. It was an easy and pleasant build - Ivan provided a partial kit - PCB, LO, BPF coils, balun transformer for the bridge, both mixers and a power splitter- the rest of the BOM is from Digikey. The top side of the PCB. The 4 coils of the BPF are shielded, each in its own compartment. It is important that they are centered and lifted from the ground plane in order to increase the Q and minimize losses. The other components are the LO, both mixers, RA SMA connectors and the voltage regulators - +6V and +5V. The most time consuming task here is to make and install the shield for the BPF coils - a certain level of precision is required while fabricating the RF shield as the tolerances are not very large. The top cover is soldered during the finalization stage. I used tin-plated brass sheet to make all RF shields - this material is very easy to form and solder. Most of the components are installed on the bottom side. Again, a lot of attention is required when building the BPF and the bottom shield for it. After adjusting the BPF, the bottom shield is installed and the filter is checked and re-aligned again as the shield might de-tune it a little. The attenuators are pretty small and should be soldered very carefully. Same thing goes for the 100 Ohm 0604 bridge resistors. The two amplifiers should be soldered carefully to avoid over-heating. Ivan provides specific instructions for installing the variable caps - no flux (or very minimal) should be used and the board must be washed with alcohol or flux remover to avoid mechanical damage to the trimmer capacitors. This picture shows an incomplete and bypassed Low-Pass filter on the low-side output. The jumper is removed and the rest of the components are installed during the finalization stage and after final alignment of the BPF. This is a plot of the BPF frequency response from the initial alignment of the filter. I was aiming at 143 MHz - 153 MHz range. 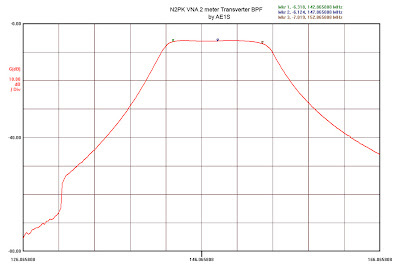 The BPF filter design allows for almost 10 MHz bandwidth in the 2m band and 20 MHz at 70cm. It can be moved a few MHz up or down from this general range if needed just by adjusting the variable BPF capacitors. During the alignment, it is important to achieve as flat as possible band-pass response and proper shape of the skirts. 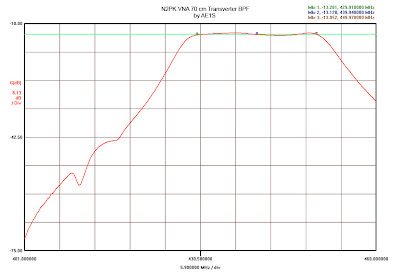 MyVNA really simplifies the use of transverters and takes care of all calculations - the user must enter the LO frequency and frequency range for the high side and myVNA translates this to the VNA's HF working range, while making a plot in the transverter's frequency range. This picture shows the 70 cm transverter. The most visible difference between the two transverters is the configuration of the band-pass filter. For instance, on the 2m transverter there are some BPF capacitors mounted on the top side just under each coil - they should be installed before the coils are soldered. These are omitted in the 70cm version. 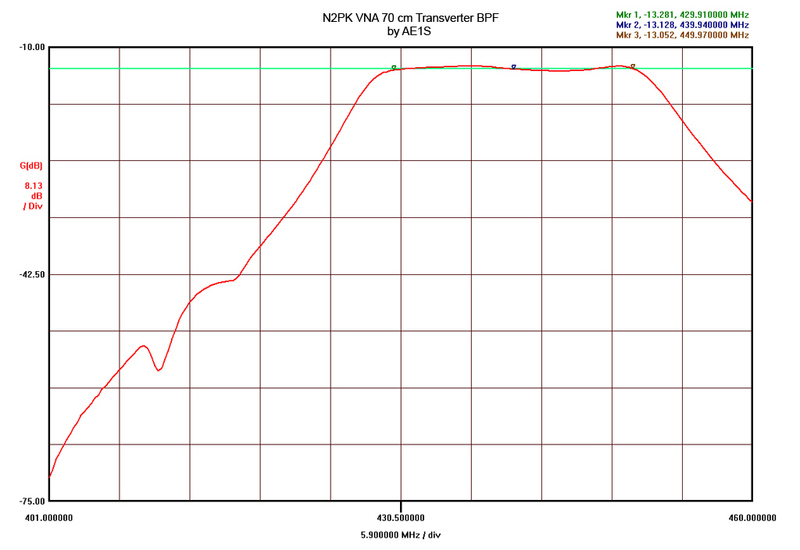 The BPF frequency response of my 70cm transverter. The insertion loss at 70cm is higher then the one of the 2m transverter at about -13 db. It can be lowered to up to -6 dB if some of the bandwidth is sacrificed but I wanted to cover the whole 430 - 450 MHz range. The finalized PCB. Shown here is the completed Low-Pass filter and the RF shielding of the BPF. As Ivan, VE3IVM noted in his build instructions, after installing the BPF shields they will slightly de-tune the filter. As expected, I had to re-align it again. A fence-type shield was installed to divide the up-convert and down-convert paths in order to reduce stray coupling and cross-talk. Almost done. I installed a toroid choke on the power line. Ivan has designed the PCB to fit in a compact extruded aluminum box - Hammond 1455C801. The board fills up the space with very little room to spare - just enough for the RF choke. It was a bit tricky to drill the holes for the SMA connectors in both panels so they match perfectly the RA connectors - the board has a small horizontal play which helps it a little. A small piece of conductive RFI gasket material (neoprene covered with metalized fabric) is pinched between the base of the RA SMA conectors and the front aluminum faceplate in order to improve grounding of the aluminum enclosure. This is the front panel. The labels on the top row are for Transmission mode measurements and the ones on the bottom - for Reflection. I made the small jumper (needed to configure the transverter for Reflection measurements) out of semi-rigid hand-formable RG-405 coax and used a spacer made from a strip FR4 board to fix the distance between the connectors.. The Hammond box is assembled in a way so the plastic trim for the front and rear panels is on the outside (instead of the "normal" way - between the enclosure and the panel plate). This improves the RF shielding as the end panels are in direct electrical contact with the enclosure - there is no gap. The rear panel and power cable. The Hirose connector for the power cable is the same type that I am using with my RF-IV test head. The accessories connector on the VNA's back panel provides +9V DC and I can power the RF-IV or the transverter directly from there. Two small semi-rigid coax jumpers with Male-BNC to Male-SMA are used to attach the transverter to the VNA's ports. Each of the transverter's ports has a Male-SMA-to-Female-SMA port saver installed (not shown).